There’s been a lot of “chatter” lately about Why Millennials are Leaving the Church, which of course, sparks a conversation on How to Keep Millennials in the Church. While both articles make some valid points, my real concern as a parent is, How do I Raise MY Kids to Love and Serve God? With children only 8 and almost-6 years old, how could I possibly know anything about raising kids who love God? Well, I don’t. Not from first-hand parenting experience, anyway. But I happen to know two fabulous parents who do know a thing or two about it…mine. My parents have raised three grown daughters who love God. Those daughters married three godly men and are serving together in their individual churches as staff members or in volunteer ministries. I’m sure if you asked them, my parents would say they made a lot of mistakes a long the way (well, my Dad probably wouldn’t say that–LOL) But for two young kids (they were 20 and 22 when I was born), I’d say they did all right. He would point me to specific Scripture addressing whatever issue or situation I struggled with. Then we would talk about what it says, and he would answer my questions. (Since those were the good ol’ KJV days, this junior higher had a lot of questions!) He didn’t force his opinions on me. He pointed me to Scripture and taught me to dig in and discover the answer for myself. In our home, my parents held God’s Word in high esteem. But it was more than a cherished family heirloom. It was the Word. Of. God. We read it. We studied it. We sang it. We memorized it and quoted it. My parents taught us that God’s Word is the Truth against which all else is measured. That helped shape our entire world view. It gave us something…the Truth…in which to ground ourselves. 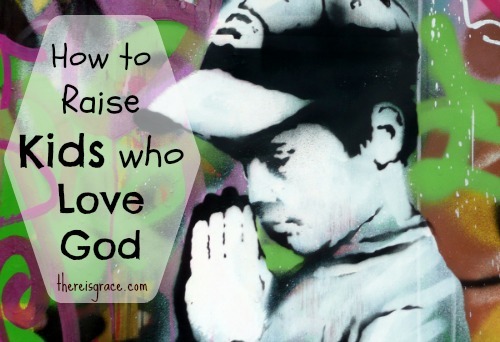 As Christian parents, we talk a lot about teaching our kids to love God. But if we neglect to teach them to love His Word, they won’t truly know Who He is. They will be left to create their own version of God based on their own ideas, or worse still, buy into the false concept of God that the world offers. If we want our kids to love God, we must teach them to love His Word. My dad was a pastor my entire life. (He still is.) Church is all we’ve ever known. I was well into adulthood before I realized most people don’t spend 4-5 nights a week at church. Still, church was not an obligation for us. OK, maybe there were times when it was an obligation for my sisters and me, but never for my dad. Yes, he had to be there, but I saw him do it because he loves it. I’m the first to admit churches aren’t perfect. Growing up in a pastor’s home, I’ve seen some pretty malicious behavior from people in the church, and sometimes from others in ministry! It’s not easy to get over hurtful things that are said about (or to) your parents. But my parents were quick to teach us that is not God’s plan for the Church. Gossip, politics, backstabbing…all the “junk” is not what the Church is about. Those things happen because churches are filled with humans. And we humans tend to be imperfect most all the time. My parents taught us that God’s plan for the Church is for believers to come together for fellowship, for teaching, for encouragement, and for helping each other carry the load. When I went off to college, finding a good church was at the top of my list. I knew I had to find a place to get connected with other believers. When we teach our kids to love God’s Church, we set them up for success in their walk with God. We don’t have to fear they will move away and “get in with the wrong crowd” or be influenced by the wrong ideology. We can be confident that they will seek out a community that will encourage them in their faith and help them in their trials. When we teach our kids to love God’s Church, we set them up for success in their walk with God. My sisters and I have fared better than many PKs we know, and we owe a lot of that to our parents. They were the same at home as they were at church. We lived by the same standards my dad preached from the pulpit. I saw them walk through trials and difficulties and lean into God for strength and wisdom. I pray I do as great a job as they did raising kids who love and serve God. Not bad for a couple of young kids trying to figure it all out, huh? Love, love, love this post!! It could almost be my personal story as well. Our parents certainly set the bar high for us, didn’t they? Yes, Lora! I was thinking of you and your family, too, as I wrote it…especially the part about loving the Church! We are so blessed with a rich heritage! My son will be 2 in December and we recite his “verse” a couple times a day, we pray together daily, and when I serve in our children’s ministry, he’s there with me. Our church is small so it’s easy for him to recognize faces. I love watching his face light up as he runs with open arms to our church family. Sounds like your little guy is getting a great foundation in life! So glad you stopped by, Vanessa! I love this post! It is much needed. I was your neighbor at Playdates With God today & am so glad that I was! Nancy, it’s wonderful to see God’s Word blessing children through the generations. One thing you pointed out is the answer, I think. Children need to see that what their parents believe is really how they act. And that God’s Word is delivered in love. Yes, Janis, I believe that is key…living what you say you believe! Thanks so much for stopping by! It is wonderful to see parents who desire to teach their children to live for God. Great post! Jenifer recently posted…Are You Ready? You are certainly off to a wonderful start, Nancy! Well said. Loving God means little if we don’t know who that God is. We must love His Word! Thank you, Julie! I’m so glad you stopped by. I love this. I was asked recently what I try to do with my kids to help them grow into people of God and my answer was like yours-what my parents did! It’s great to have a godly heritage, isn’t it? Thanks so much for dropping in Helene!